resistant technology creates a long lasting bond to almost any clean, dry surface. almost any surface. The adhesive is engineered to not harden or break over time. Available in clear, black or brown on either sheets or rolls. in extremely high and low temperatures (-240°c to +260°c ). 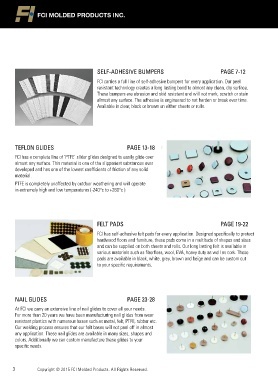 At FCI we carry an extensive line of nail glides to cover all your needs. resistant plastics with numerous bases such as metal, felt, PTFE, rubber etc. 3 Copyright ? 2015 FCI Molded Products. All Rights Reserved.